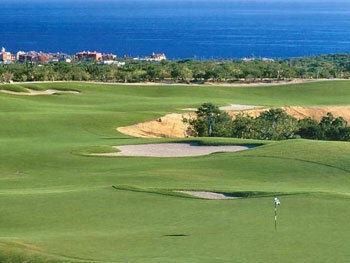 Cabo del Sol has been ranked among the top 100 courses in the world by Golf Magazine. Site of numerous championship tournaments, Cabo del Sol is a true golfers paradise with scenic greens overlooking the shimmering Sea of Cortez. A 40,000 sq. ft. hacienda-style clubhouse offers a refined atmosphere and the Golf Shop stocks a great selection of accessories, equipment and golf fashion. At Cabo del Sol, the finest in course design meets the highest U.S. standards of play in a remarkable setting of unparalleled beauty. The Cabo del Sol Ocean Course has attracted world-class golfers to Los Cabos since 1994. This splendid Jack Nicklaus Signature Design unfolds along breathtaking scenery of desert, mountains and sea. Boasting seven exhilarating holes along the stunning coastline of the Sea of Cortez, the Ocean Course ends with three of the best finishing holes in all of golf. Designed by Tom Weiskopf, the Cabo del Sol Desert Course is cleverly carved across the desert landscapes of Los Cabos. Golfers are captivated by its blend of desert and ocean views, with challenging canyon-like arroyos. Ocean views from all 18 holes create a awe-inspiring setting. Rolling greens, elevation shifts and dramatic bunkering make the Desert Course a true pleasure to play. *Rates include green fee, shared golf cart, practice balls, bottled water, & VISAGE GPS in Golf Carts for both courses. Beef, Chicken, Fish and Shrimp Tacos are included at the turn when you play the Ocean Course. All rates are in US Dollar and include applicable taxes. Rates are subject to change without notice. Same day replay rates available. Golf Club Rental Fees: Taylor Made M1 & M2 clubs available for rental in men and women both right and left hand models. Dress Policy: Collared or mock neck shirts required. Shorts must be bermuda length. Tennis shoes are allowed. Groups of 17 players or more at the Cabo del Sol courses are subject to group rates. Surrounded by the Cabo del Sol golf course, the Hacienda del Mar Resort is a great getaway. This resort offers panoramic vistas over the Sea of Cortez from Lands End to the San José del Cabo coastline. Located in Los Cabos exclusive Cabo del Sol golf community, this resort is breathtaking.